This book is a collaborative effort by Tena Scarber, Acupuncturist and Founder of Innovative Healing Center, and Jack Tips, Ph.D. and Naturopathic Doctor. 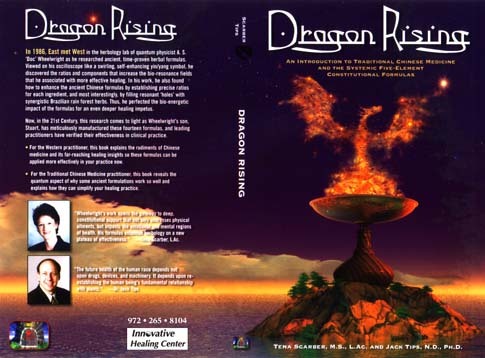 Dragon Rising teaches the basic principles and the foundation of Traditional Chinese Medicine (TCM). The purpose is to provide a basic understanding of the ancient healing art of acupuncture to the lay person and non-TCM-trained health professional. It explains the system of diagnosis and clinical application of treatment principles. Readers will walk away with tools for evaluating and understanding their own imbalances. Acupuncture is one of the oldest, most commonly used medical procedures in the world. The Huang Di Nei Jing, Yellow Emperor’s Classic of Chinese Medicine dated 2,500 years ago is the oldest medical textbook in the world and is the first record of acupuncture. Dr. Shen Nung, the father of Chinese Medicine documented theories about the heart, pulse and circulation 4,000 years before European medicine had any concept about them. Ancient doctors determined that there were energetic pathways in the body , called meridians. They were mapped over thousands of years of observation, experience, and experimentation. Meridians conduct energy throughout the body and assure the free flow of vital substances to nourish every cell. As long as the energy flows freely through these pathways health is maintained. Modern medicine can measure the meridians with electro-meridian devices much the same as electro-cardiogram patterns are measured in the heart or electro-encephalogram brain wave patterns are measured. It is amazing that today’s technology proves the presence and accuracy of meridians mapped thousands of years ago! Many studies by Eastern and Western doctors have proven the presence of this system as well as the benefit that manipulating it has on the various organs. The meridian network in the body connects cells and organs much like the worldwide web communication network connects people and countries. An electro-magnetic energy flows through these channels, nourishing and warming every cell and delivering a message to function normally. Asians call this energy “Qi” (pronounced “Chi”), European and Western practitioners call the energy “Life Force”or “Vital Force.” This energy force contains all aspects essential to life including the physical, mental, emotional, and spiritual aspects. The circulatory, nervous, and lymphatic systems, are all strongly affected by the meridian system. If energy flow is blocked, excessive, or deficient for any emotional or physical reason, there is disruption of health that results in pain and illness. In normal physiological conditions, the energy flows up and down, inside and outside without any obstruction, the Qi and blood circulate without ending, and the body is healthy and free from disorder. Regular treatments keep the vital Qi strong, ensure balance, and promote optimum health. If there is too much energy in a meridian it is reduced and when there is too little energy it is increased. Various needle techniques are used to achieve the desired effect. Acupuncture points are areas on the meridians where the energy comes to the surface of the body to form highly sensitive electrical areas, or vortexes of energy. Inserting needles at these powerful points activates the central nervous system to release neurochemicals and neurohormones into the muscles, spinal cord, and brain that influences the body’s self-regulating system. The endorphins and other neurochemicals relax the whole body, relieve pain, and interact with the hormonal system to promote a sense of well – being, increase circulation, and decrease inflammation. The immune system also responds with an increased T-cell count, which stimulates the immunity. All tissue healing is dependent upon good circulation to deliver nutrients to damaged areas. This effect is paramount in pain relief and recovery from injury. According to the “Gate Control” theory, the perception of pain is controlled by a part of the nervous system that receives the impulse from the body and interprets it as pain. Only a certain number of impulses can go through the gate at one time. When the gate is bombarded with stimulus, it becomes overwhelmed and closes. Small nerve fibers called “C” fibers carry pain impulses. These are that gates that close during acupuncture to break the cycle of pain, spasm, and more pain. Professor Jayasuriya wrote a paper for the 5th World Congress of acupuncture in 1977 revealing the “Motor Gate” theory. In the theory some forms of paralysis can be overcome by acupuncture treatment. His research disclosed that the activation of muscle spindle cells of the gamma motor neurons causes an electrical discharge that makes the intrafusal muscle fibers contract. 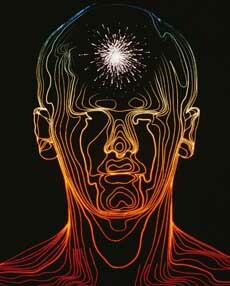 Once the nerve pathway is re-activated, the muscle may contract by normal brain impulse activation. While acupuncture needles vary in size, most are very thin (the diameter of two or three hairs put together), solid, and metallic. Often times the client / patient does not even feel the insertion of the needle and becomes so relaxed that they fall asleep during the treatment. Many Americans have a “needle phobia” because of some negative experience with an injection or drawing of blood. Acupuncture is nothing comparable to either of these events. In fact, if the person will relax and be receptive the experience is very enjoyable. The immediate release of the brain’s “feel good” chemicals imparts an instant sense of well – being and the benefits received are so welcomed that clients look forward to their treatments. Note that there are times that needle stimulation is necessary to evoke desired results and this requires that the patient breath and work with the sensations to improve the outcome of the treatment. For example, when there is sciatic pain due to an impingement. In order to “unblock” the area and relieve the pain the acupuncturist manipulates the needle and the patient reports when the pain in the area subsides. Often times by the end of the treatment the pain has completely disappeared. Needles may be made of gold, silver, or stainless steel. Each metal elicits a different response when used. Gold strengthens deficiencies; silver reduces excesses, and stainless steel is neutral.